People ask us how we do it. How do we provide a free platform that gets needed goods to charities across the country? The answer is, it takes a YouGiveGoods village comprised of passionate employees always looking to improve the process, integrated technology, and key partners. Because of this we are excited to announce our new order fulfillment partnership with Pilot Freight Services. An important part of our process is ensuring that new, donated goods are delivered to the charity quickly, smoothly and in excellent condition. With almost 300 items offered across hundreds of individual giving events running simultaneously on our site, integrated systems and our logistics partner are extremely crucial. Pilot Freight Services is a worldwide provider of transportation and logistics services. Their attention to detail and commitment to customer service aligned perfectly with our needs. And, we were wowed by their brand-new (opened in September 2017) 65,000 sq foot warehouse and their up-to-date technology used in the fulfillment of our orders. 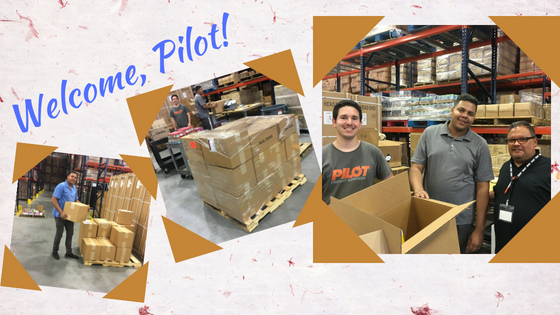 In mid-July, Pilot began their first YouGiveGoods shipments. We got up and running quickly as we stocked the warehouse with loads of school supplies and started shipping them out to charities and schools in time for the start of the school year. The Pilot warehouse manager, Angel Collado, our team lead, Junior Nunez, and their whole crew have been simply fabulous during this transition time. We are feeling very confident that we are in good hands as we enter the busy holiday giving season. Customer experience is important to us every step of the way. And when we think of our “customers” we are thinking not just of those shopping on YouGiveGoods, but the event sponsor, the event organizer, the charity recipient and finally the person (or pet) in need into whose hands the donated goods are ultimately delivered. Bringing on Pilot Freight Services is another step forward to providing the best quality service that exceeds all of our customers’ expectations. Welcome to the team, Pilot Freight Services!